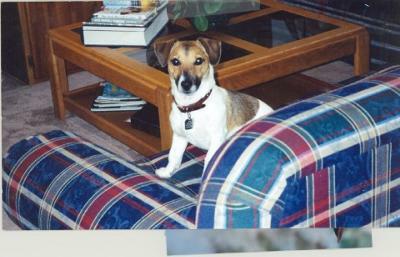 Originally from Gridley, CA, Buddy-Ray Kirk has resided in Reno, NV, for all his life with his humans - Jerry and Merri. Buddy turned 10 years of age on October 21, 2008. His likes are his human Mommy and Daddy, his soft yellow duck, and of course, his 91 Tennis Balls! A real fanatic about tennis balls is this little guy! He's a fearless little guy who thinks like a big dog. There are no obstacles in this little guy's life. He's sixteen pounds of true love!